The 2018 Dunlop MSA British Touring Car Championship is rapidly heading towards its climax, with a seminal penultimate outing of the season at Silverstone to come next weekend (15/16 September), and Colin Turkington heads there with an extended standings lead after a strong showing at Knockhill last time around. Team BMW’s double champion made the most of his rivals’ woes to steal a march atop the table, with closest contestants Tom Ingram and Ash Sutton falling foul of a ride-height technicality in race two at Knockhill, costing them vital ground as the championship enters its final stretch. Turkington’s double podium finish in Scotland ensured he takes a 43-point advantage over Speedworks’ Ingram to Silverstone, and he counts a further eight points between himself and the third-placed driver, Subaru’s incumbent champion Sutton. That said, with almost 140 points still to play for over the remaining six rounds of the campaign, the experienced Northern Irishman will be keenly aware that the destination of the most coveted crown in British motorsport is far from certain. Though that trio head the way, as many as 12 drivers remain in mathematical contention, and Silverstone, which has played host to many a pivotal moment in motor racing history down the years, could be vital in deciding just where the crown will be heading come the end of the season. A capacity grid of the very best touring car talent will be out in force at the home of British motorsport – an ever-popular locale on the calendar – and all of the action is set to unfold in front of packed grandstands and spectator banks around the famous circuit, while many more will be watching live and free-to-air on ITV4. 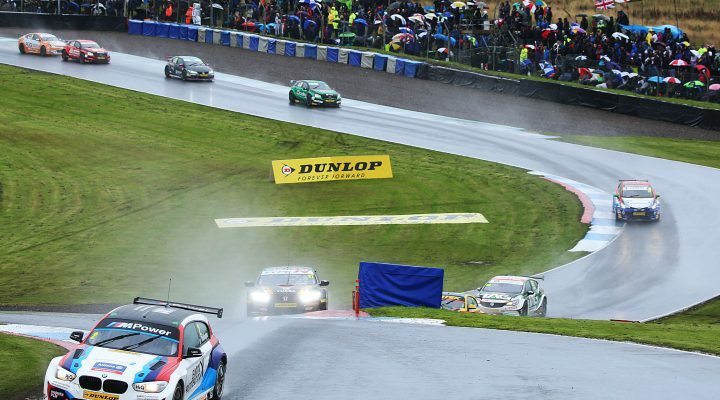 Consistency is a key component in assembling a title-winning BTCC campaign. Given just how hotly-contested the racing is in the championship, a measured approach to racecraft alongside raw pace and engineering nous is a must. Turkington has honed this strategy over a decade-and-a-half in Britain’s top-tier motor racing series – a catalogue of experience that means he has a handle of when to hold and when to fold. So far this season, he counts a single victory to his name – the second encounter at Oulton Park. Speedworks’ Ingram meanwhile has a pair of victories, with third-placed Sutton counting a benchmark five. Despite this, it is Turkington in the clear at the top of the table – no driver has notched more podium appearances than he, with nine visits to the rostrum so far. Furthermore, he has finished outside of the top ten on just five occasions this season and has failed to reach the chequered flag only twice. It is this stream of points-scoring finishes, 16 of which have been inside the top six, that leaves the two-time title-winner in the pound seat ahead of the final six rounds. Last year at Silverstone, however, Ingram enjoyed his highest-ever points-scoring weekend in the BTCC with a mighty 52-point haul after a race one win and a race two podium, as opposed to Turkington’s 28-point grab. Sutton, meanwhile bagged 29 points. Drama was abound with Sutton’s Subaru sent to the back of the grid ahead of the finale after a third penalty strike, following contact with Turkington as the pair battled for third with the 2017 title fight reaching boiling point. Race three then saw the BMW man suffer as he became entangled in the mid-pack action, suffering damage that restricted him to only 22nd at the chequered flag. Sutton, meanwhile, recovered from his penalty to take 11th spot and points – seeing him leave Northamptonshire top of the pile. If two rounds of the BTCC showed everything is liable to change at a moment’s notice, those at Silverstone last year were just that. With that in mind, Turkington’s closest rivals will be ready and waiting to pounce. All three BTCC races on Sunday, 16 September – and the day’s other races – will be broadcast live and in high definition on ITV4. Those in attendance at the circuit can stay in touch with the commentary and live timing from every session, available at btcc.net/live throughout the weekend. The support series on the TOCA package are also guaranteed to thrill, with a double-digit total of races set to entertain the crowds. The Renault UK Clio Cup, Porsche Carrera Cup GB, F4 British Championship and the Ginettas will all be appearing, making for a jam-packed weekend of truly unmissable racing. Advance tickets can be booked online at www.silverstone.co.uk or via the hotline on 0844 3728 270. Tickets start at £15 with weekend passes costing £39 in advance, or Sunday race day tickets £29. Children aged 15 and under get in free.